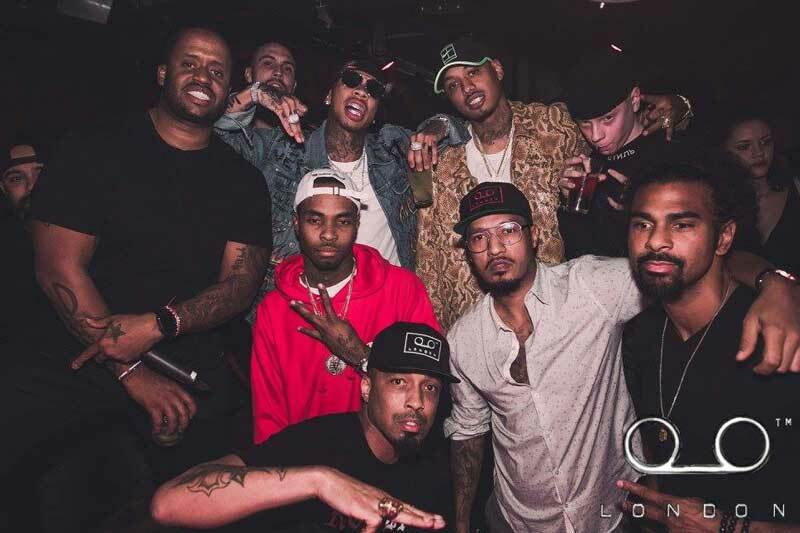 Inspired by Dallas Austin, who produced records for Madonna, Michael Jackson, Duran Duran, Rihanna and Gwen Stefani, Tape is the London hotspot for the musically inclined. With the distinct set-up of having a recording studio within the club itself, you get more than your money’s worth with your Tape prices. Tape said it best that “everything begins with music”. Tapes interiors pay homage with its love for music through its unique decorations. Once you enter the club you’ll feel like you are “walking into the brass mouth of a trombone”. Chandeliers that look like the horn of a gramophone will greet you and gilded copper effects adorn the walls. It is no wonder that Tape became the home for top global musicians, internationally renowned DJs, influential producers and other artists in the music industry as well as other celebrities. If you want to be part of the musical world that Tape has to offer, read further and find out more about the Tape entry price and other details. Tape follows a strict door policy so it is best to follow the Tape dress code. Keep it smart casual and elegant but feel free to be comfortable enough that you can still dance to the top-notch music that Tape provides. Gentlemen can gain access to Tape by paying £20 while ladies are free before midnight. After midnight, ladies have to pay the Tape entry price of £20. With a capacity for only 250 people, only a select few can access Tape. 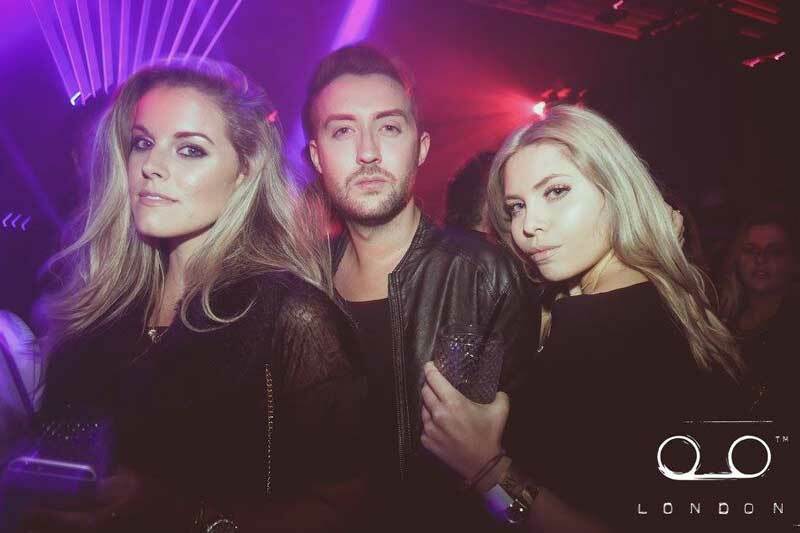 To beat the long queues and get ahead of the crowd, it is recommended that you become a part of the Tape guestlist. 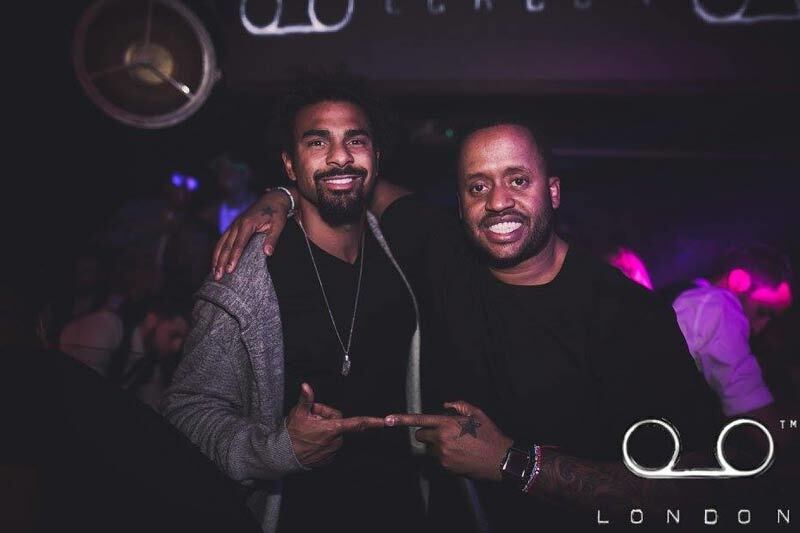 Book your evening in advance with Club Bookers to get the best deals and to ensure a spot on the guestlist. Another surefire way to make the most of your night of music in Tape is to avail of their table booking. Tape table booking prices vary depending on table type and include minimum spends worth of bottles of your choice from a menu provided so it pays to know the Tape bottle prices as well! Small tables come at £500 minimum spend, stage tables at £1,000 minimum spend, and VIP booths at £1,500 minimum spend. If performers are hosting, table prices can reach up to £2,500 or it can vary depending on the event. Tape offers a variety of drinks like Champagnes, Cognacs, Whiskeys, and Rum to name a few. Tape bottle prices for Champagne favorite Dom Perignon Vintage Methuselah is at £25,000 while Louis Roederer Cristal Methuselah, another top favorite, is at £35,000. 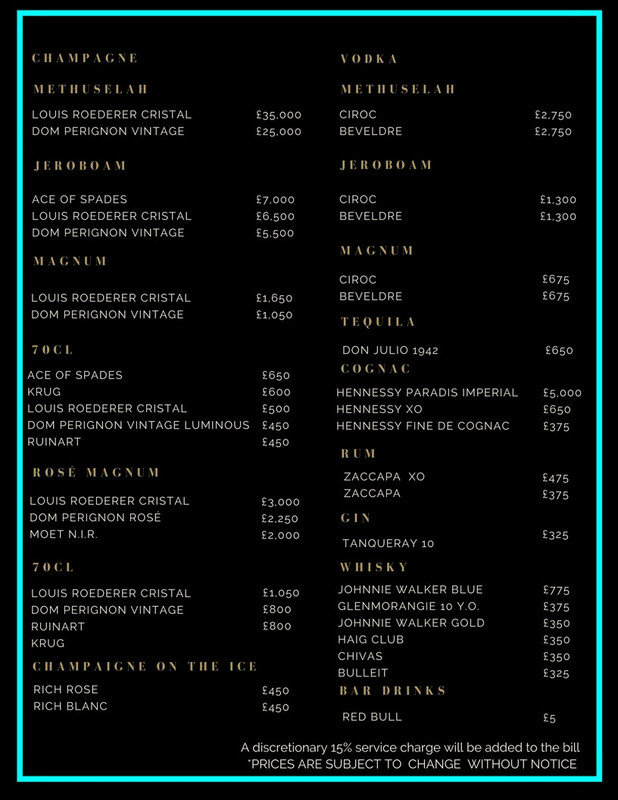 If the prices are too steep you can choose for a smaller bottle or other favorites like a Johnnie Walker Gold for £350, Haig Club at £350 or Hennessy Fine de Cognac at £375. 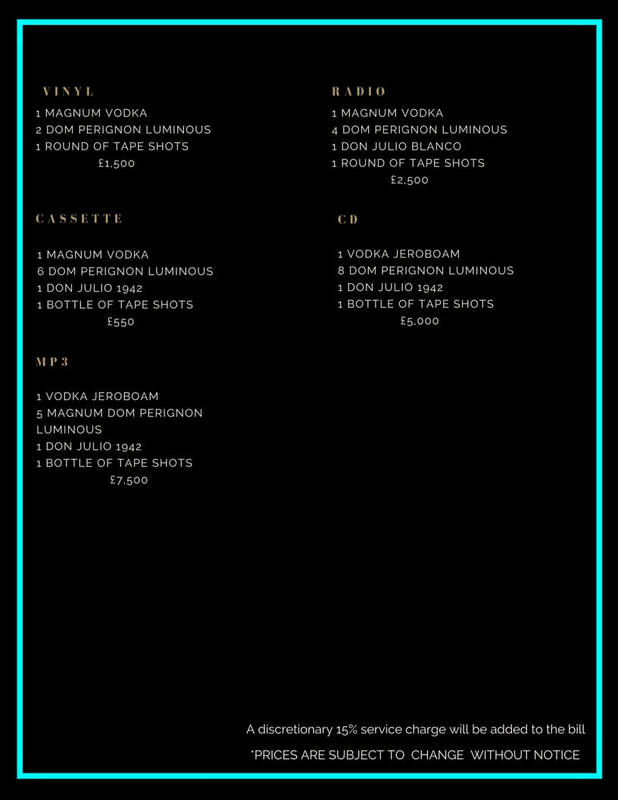 For more details on Tape bottle prices and table bookings, contact Club Bookers and we will be happy to assist you.